George Graham Reviews Matt Pond PA's "Winter Lives"
With so much of today’s commercial pop music being so tuneless, soulless, computer-generated and processed, and utterly artificial and phony, there has been a kind of ongoing reaction to that from independent artists and bands who have been providing an antidote with with lots of rootsy music from folk to soul to rockabilly. The folk-influenced aspect has been rather interesting with groups like Mumford and Sons and the Avett Brothers enjoying a degree of success on the scene. This week we have a new album by a fairly long-running band who visit mellow acoustic territory with an enjoyable album that borrows from the folk group scene of the 1960s as well as incorporating more contemporary elements. The group is called Matt Pond PA, and their new recording, their 11th full length album is called Winter Lives. 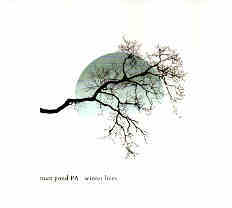 Matt Pond PA was founded by it namesake, Matt Pond around 1998 in the Philadelphia area. Now based in New York, they have had a somewhat rotating cast of supplementary musicians, with guitarist Chris Hansen being a constant presence since 2010. Their first album Deer Apartments attracted attention on the independent music scene, and they gradually gained momentum which was aided when a track called Snow Day from their 2005 EP Winter Songs was used in a Starbucks TV commercial. Winter is also definitely the theme of their new album, Winter Lives, with most of the songs on it making at least a passing reference to winter or snow. Most do so in a romantic way, or using winter as the context for love. Thus, on the whole, lyrically, the album ranges from contemplative to celebratory. But the band’s instrumental sound is its principal calling card, being mainly acoustic, folky, melodic and generally upbeat, with rather classic folk-style vocal harmonies. Those with very long memories might find a resemblance to the Byrds at times in the harmonies, with the acoustic-guitar-dominated band sound that could have come from anywhere in the last 50 years. There is a frequently heard cello, adding to the acoustic aura, and occasional banjos add to the texture. In addition to Matt Pond, who is heard on the guitars and vocals, and producer Chris Hansen is on multiple guitars, bass and keyboards, also appearing are cellist Shawn Alpay plus drummer-percussionists Chris Turko and Sean Hansen depending on the tune, and some additional backing vocalists. The emphasis on the instrumental sound is underscored by the presence of three instrumental tracks, though all are short and more in the way of interludes. Winter Lives the new album by the veteran indie band Matt Pond PA is an enjoyable folk-influenced record which provides a nice antidote to mindless electronically generated commercial pop. It’s my no means a weighty album lyrically like some of the folk rock that Matt Pond borrows from stylistically. Instead it’s a set of pleasing songs that mostly relate to winter. So it’s almost like a concept album of old. And to add to the nostalgic air, the album is being made available on colored vinyl. Our grade for sound quality is about a B+. The acoustic instrumentation is handled well, but as is usually the case these days, the sound is cranked up with volume compression to the point that some of the tracks have an annoyingly “in-your-face” sound, inappropriate for the instrumental textures of the album. Matt Pond and his group Matt Pond PA have over the past decade and a half been striking a nice balance between a kind of nostalgic folky sound and elements of contemporary indie rock. Their new release Winter Lives is the personification of that, while proving ideal listening for a cold winter’s day. (c) Copyright 2017 George D. Graham. All rights reserved.